We’re now publishing the second part of the answers of Grandmaster Ruslan Ponomariov to the questions of chess fans, posed as part of the “KC-Conference” project by members of the Russian KasparovChess forum and readers of the English language site Chess in Translation. In the second part of this “people’s interview” the 2002 FIDE World Champion responded in detail to questions on internet chess, chess literature and journalism, the principles of preparation and improvement, openings, non-classical forms of chess, other games and also simply “on life”. Part 2 of Ruslan Ponomariov’s KC-Conference is being published simultaneously in Russian. Remember that in the first part of the conference the Ukrainian grandmaster responded in detail to questions on his outlook on chess, his career, his chess-playing colleagues and chess politics. It was also the first time that he gave an in-depth account of his view of the sensational cancellation of his match against Garry Kasparov in 2003. Discussion can be continued: in Russian – on the KasparovChess forum thread, and in English at Chess in Translation. *** Questions posed in English at Chess in Translation are indicated by [CiT]. vasa: Ruslan, what was your favourite chess book in your childhood? Do you read chess literature nowadays? I already mentioned that in my childhood I really liked Zak and Dlugolensky’s book “To give up in order to find”. In general, I grew up as a chess player on books. My first computer appeared when I’d already become a grandmaster, and even then I only used it in order not to have to carry all my notebooks with analysis around with me. And during the World Championship in Moscow in 2001 my computer broke down. I had to play from memory! I’m also grateful to Gennady Pavlovich Kuzmin, who constantly instilled optimism into me back then before the games. Of course, computers have now changed the preparation situation, but chess books still haven’t lost their relevance for me today. It’s just that now there are a great number of them: both good and bad. It’s not so simple to choose what to buy, particularly on the internet, when you can’t hold the book in your hands. I try to read reviews in advance, listen to recommendations from friends, and then I’ve got my own particular preferences as well. Sometimes I come across electronic versions of books. If the book strikes me as interesting, then I’ll buy it. For me the paper version remains much more pleasant to take in. In general, reading chess books differs from reading fiction. I usually have a preliminary visual look through the book, and not always in order. Then, if something interests me, or I want to remember something better, I investigate it at the chessboard. To be honest, I’ve never liked Dvoretsky’s books: they’re too academic, perhaps, and tough to take in. Botvinnik himself wrote about methods of preparation a long time before that, and much better. If you take the calculation of variations, then among contemporary books there’s a very good one which has recently been published by Volokitin and Grabinsky. But I can’t say I have a favourite author. I read chess books on various topics, and there have been good ones, for example, by Sosonko, Nunn, Khalifman, Avrukh, Kasparov and Moskalenko. markkozyk: What reading material would you recommend to players with a rating from 1900-2100? I don’t want to promote someone in particular, and I don’t know what topics interest you most. Personally, for example, I prefer reading chess literature like “Elegy” by Sally Landau, “The Reliable Past” by Sosonko and, to a degree, “The Luzhin Defence”, “Flemish Board” and “The Eight” (although that’s more fiction with some connection to chess). Read professional reviews, and you’ll definitely find something to interest you while not wasting your money on “garbage”. ccf-m: Have you read any works by A. N. Terekhin? Which? No, I haven’t read any. I’ve somehow never laid eyes on them, so I can’t say anything about them, either good, or bad. Valchess: Ruslan, my traditional questions about chess journalism. - Are their publications that you try to read (or even subscribe to) – or do you simply glance at them if you come across them, not worrying if you miss them? And the same question – on chess sites and blogs. I regularly read the Russian “64” and the English-language “New in Chess”. I don’t go onto forums or blogs, though if something’s written about me there then someone might tell me about it I also can’t say that I carefully read the material on any particular chess site. It’s more that I have a quick look, so as not to miss any news or information that’s of interest to me. - Which well-known journalists do you rate? Are there any Ukrainian journalists among those? If you’re talking about professional Ukrainian journalists regularly writing about chess, then I can only pick out Mikhail Golubev and Anatoly Javorsky. If you’re talking about real journalists, then I remember recently buying (in Moscow on New Arbat Street) and reading an autobiography by Larry King. A very interesting book! Such a stormy life and a talent for interviewing diverse people on diverse topics! Although King, of course, has his genre, while chess journalists have their own. -The same question – but about professional chess commentators. Is it interesting for a chess player at your level to follow live commentary and/or to read games that someone’s analysed in print, or is that only for fans? It’s interesting to follow live commentary but, unfortunately, there’s not enough time for that. I often look at games the next day, when they’ve already been played: like reading the morning newspaper over a cup of coffee If there are commentaries then I look at the games with them. 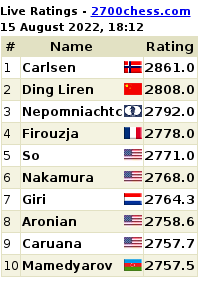 If there aren’t, then I simply look at the text of the games in ChessBase. It’s true, however, that commentaries aren’t always interesting. For example: Sergey Shipov delves into the games quite deeply and is interesting to read, while Sergey Zagrebelny isn’t always so engaging. I have the impression I could get the same thing if I switched on a computer. - Do people come to you with requests that you write something, or commentate? - And what was the story with your recent interview with D. Komarov, as mentioned on our forum (did it take place or not)? There are different categories of journalist: some work professionally, while others act in a slipshod manner. D. Komarov has a habit of "composing" interviews himself. Among his "pearls", which he takes great pride in, was a big interview with Joel Lautier, the winner of a tournament in Odessa, after a single formal telephone call. Or the "exclusive interview" where Vladimir Kramnik allegedly told him how he lost his virginity. I think you can probably still try and find those articles in the electronic archives of the "Fakty" newspaper. In my case (in Russian; in English) he didn't even try to contact me, but simply compiled different material from various sources. That, in my view, is wrong, and gives the reader a false impression. vasa: Which chess sites do you visit, if you visit any? Among English-language sites the one I like most is ChessVibes. If I want to have the latest games then I use TWIC, www.chesspublishing.com and Chess Today. Among the Russian sites - ChessPro and Crestbook. Глафира: Do you follow tournaments on the internet? The super-tournament in London, for example? I was a spectator at the Bilbao 2008 and Moscow 2010 tournaments. Of course, not from start to finish. I wanted to travel to the London tournament in 2009, but back then I ended up playing for quite a long time myself in Khanty-Mansiysk, plus I had some problems with the English consulate. Otherwise yes, I end up having to watch the tournaments on the internet. vasa: A selfish question. What do you think, is there any point in having commentary by a Class A player on grandmaster games, given the current state of affairs (with engines, opening books and so on)? Серегааа: How can you quickly improve your chess? Quickly? I'm afraid it's impossible. Except, perhaps, in the "field of wonders" from "Buratino" It seems to me that you spend your whole life trying to improve and refine your skills. vasa: Could you share with us how you work on chess in general? The main thing is: chess demands creativity. You always have to come up with something new, some means of surprising your opponent, as otherwise it's hard to beat even a player with a 2600-rating. The lion's share of your time is taken up by the processing of information: books, databases, chess articles and magazines. It's also very important to have energy, as you won't get anywhere unless you're ready physically. Otherwise you can get an interesting position out of the opening, but then your brain won't work properly after that. ccf-m: Could you reveal your special methods of preparation (or at least some of them)? In my opinion no particular methods of preparation exist: Botvinnik described a long time ago how you need to go about preparing for tournaments. We've simply got new tools nowadays: computers, the internet, and in general information has become more accessible and spreads faster. Perhaps each person has their own individual peculiarities: for me, for example, it's important to establish a creative atmosphere, and it's also important to improve my concentration and have no distractions. vasa: How much time do you devote to chess each day? I never was an IM, and became a grandmaster when I was 14 years old. At that age I wasn't distracted by everyday problems, didn't have any temptations, and really enjoyed chess, so I could devote all my free time to it. I think it's very difficult to get results without a good trainer. At school and university good teachers can explain a subject to you. It's the same with chess. Veritas: Hello, Ruslan Olegovich! Allow me personally, and also in the name of the young players of the amateur chess club, Veritas (from Bila Tserkva), to express our gratitude for your taking part in this conference, and to ask you a few questions. - At the end of the nineties, while still a school pupil, you gave an interview to Marina Makarycheva, in which, in particular, you said that you worked on chess eight hours a day, and that you studied individually and got only the best grades. Could you tell us how you managed, at school age, to master the skill of taking a professional approach to the task at hand, and were able to work what was in fact a full working day? Did they mark your work objectively at school, or did they make an exception for you as a sportsman? I really liked chess, so for me it was a pleasure rather than a job. Plus, I was very lucky with my trainers: studying was never boring. I remember I had some problems at school to begin with: I missed an awful lot, and because of bureaucratic procrastination it wasn't so easy to get individual teaching. But somehow the problem was resolved. I was also helped by my father: when I travelled from Kramatorsk to Gorlovka to my parents, he would study with me, and help me prepare for exams. - At last year's (2009) Tal Memorial in the game against Kramnik it seemed as though you'd out-calculated your opponent, had the initiative, and were clearly playing for a win with Black. Can you give a brief commentary on the key moments of that dramatic encounter? I commentated on that epic battle in detail for one of the issues of the magazine "64". What else can I add? The game was a double-edged struggle. I could also have won it, but in the end Vladimir calculated the lines better than me, and I lost But then in the tournament in Dortmund I took my revenge! - During our training sessions we try to understand and analyse the strongest features of the chess champions. Which area of your chess would you advise us to study in detail? And which of the games you've played would you advise us to look at as an example? It's somehow a bit immodest to talk about my own games: my play's far from perfection, and chess itself is quite multi-faceted. Besides those games given above [Editor's note: See the "Selected Games" in Part 1 of the Conference], I can recommend you look at the games from my match against Ivanchuk. You'll find many mistakes, but also a great amount of real struggle! - In 1977 I was lucky enough to spend 10 minutes talking with, and then playing in a simultaneous exhibition against, David Bronstein (who comes from Bila Tserkva himself), and that was and remains one of my most vivid memories. Tell me, Ruslan Olegovich, is it possible to play you at the moment in a simul, and if yes, then how should I get in touch with you, or with someone who decides such questions? (if for any reason you can't answer that question now then we're always happy to hear any news from you about your tours, simuls and other chess events, at the Veritas club's e-mail address: Veritas_club@ukr.net) Thank you in advance for your replies. I wish you good health and future victories. We're proud of you. You're our champion!!! I visited Bila Tserkva to give a chess lecture in, I think, spring 2004. You used to have a team that would regularly travel to the Ukrainian team championship in Alushta, and one of the team managers invited me and organised that encounter. Unfortunately, I don't have the resources to organise such events myself. But the "Klichko Bloc" was involved in organising chess tournaments in the Kiev region, in particular in the town of Vyshneve and the village of Malaya Dymerka in the Brovarsky District, and I travelled there to give simuls and lectures. I think they'd also be interested in organising something in Bila Tserkva. In Kiev we’ve organised simultaneous displays on Khreshchatyk Street in cooperation with the Ministry of Sport, either on Children's Day or Physical Culture Day. I think something similar will happen this year as well. Without a trainer it's difficult. But I can, for example, advise you to play more often against players who are stronger than you are. That depends on what you want out of the game, and also on your tournament position. Do you want to earn a couple of rating points, for example by drawing, or do you simply want to enjoy the game. I can advise you to try and maintain a clear head even in the most complex situations. But at the same time - chess isn't poker: an amateur isn't capable of beating the World Champion in any one-off game. I'm afraid this might be seen as advertising, but I can recommend you the book "Perfect Your Chess" by Volokitin and Grabinsky. In my opinion it really is very good. phisey: Could you please formulate the three main criteria required to play successfully in knockout championships. If that's to be expressed in only three words, then - "I came, I saw, I conquered" But, in general, it's extremely difficult to win two knockout championships in a row. I don't know whether anyone's ever managed it in chess? Although in tennis almost all the events are knockouts, and it's not a rarity there. Well, if I always managed to maintain concentration then there wouldn't be any mistakes in my games But I can say, for example, that drinking some water at a critical moment, when your lips are drying out from the tension, can really help. Jazzman: Dear Ruslan, I heard that it's very important for a chess player to maintain his physical shape. Do you do that? If so, then how? So that it isn't boring I try to engage in different types of activities. I swim, cycle, hike and also go to the gym and do yoga. I recently learnt to roller skate. shyev: Hello, Ruslan! At the super-tournament you won in Dortmund Efimenko was working with you. How important for you now is the role played by a second? Are they expensive? And can you achieve results at the highest level without a coach/second? But overall, you can't compete at the very highest level without a team. If you take the recent World Championship matches, then Anand, Kramnik and Topalov didn't even just have one second, but a whole brigade. For that, of course, the stakes are different as well. Therefore, from an economic point of view, it's something you can afford. Серегаа: What distinguishes a 2400 IM from a 2700+ GM? How can you pick up those 300 points?! A 2700+ GM plays better, earns more, gets more invitations to tournaments and therefore can have a more professional tournament schedule, hold training sessions with other strong GMs and have the most up-to-date computer and literature. A 2400 IM needs to invest more funds and play in challenger events with others in the same position in order to get through that tough selection and gain those 300 points. At that stage, however, you have to avoid getting stuck in a vicious circle where in order to gain rating points and earn money for trips and the training process you begin to play too much, and your tournament schedule suffers. And your results get worse. Without results you won't get better invitations to tournaments, but if you don't play much you won't get enough practice, and you're not always going to finish among the prizes. And it turns out that you're going in circles. You have to make a super-human effort in order to make it to a new and more advanced level, but that doesn't work out for everyone. And some people in any case prefer to go from one open tournament to another, satisfied with what they've already achieved. ccf-m: Many masters need only a short period of time to become grandmasters. What (where), in your opinion, is the difference between 1) a grandmaster and a master, and 2) a master and simply a Class A player? I no longer understand the titles very well. I get the impression that it's much easier to become a master or grandmaster than it was 10 years ago. Basically, ratings have become the guide now. For example, the recent Moscow Open tournament was actually won by someone [Editor's note: Vladimir Belous] without any title at all. mimmmis: Hello Ruslan! I have noticed that every chess player in his career has a barrier which prevents him from going further. For example, some chess players quickly become IMs and no matter how hard they try they can’t improve. In actual fact everything depends on your perseverance. If it was possible, for example, to devote 10 hours to chess with the guarantee that it would raise your rating 10 points, then everything would be much simpler. I've had situations where I seemed to be studying chess a lot, but without seeing any results. Then at a certain moment something clicks, and the quantity is transformed into quality. Valchess: Could you tell us some more about the tournament that recently finished in Wijk aan Zee? How did you prepare and what conclusions did you draw from it? In my view, as a non-professional, given the positions you had you underscored more than any other participant. The last time I played in Holland was in 2007, after which there was a big gap. I'd like to take this opportunity to thank the organisers for giving me the opportunity to play in one of the year's strongest tournaments. Such competitive experience is always invaluable. Playing the strongest chess players in the world you learn a lot, and begin to play better yourself. The previous super-tournament I played in was Dortmund in July last year, and it didn't go badly. I would also, of course, have liked to perform well here! True, I can't call Wijk aan Zee a lucky place for me: twice I scored -1 and once 50%. So the minimum goal I set myself was to at least improve on that result! It was necessary to prepare 13 "Whites" and 13 "Blacks". The work required really is great, and there's never enough time. Plus, it was necessary to get through the New Year and Christmas holidays safely - as it's very important to follow a fitness regime, but the tournament began at the start of the year. I got lucky with the draw, as I drew the first number and therefore got to play one more game with White. That gives you a certain edge, of course. Perhaps it's not so noticeable as in, for example, the Tal Memorial, where there are 9 rounds, but such trifles can still influence the final result. By the way, wouldn’t it be worth altering the rules a little and, for example, forcing the first seven participants in terms of rating to be seeded at the bottom of the table, while the weaker players (according to rating) would be given numbers in the top half? It seems to me that would make the tournament struggle more engaging, and it would be fairer. Nevertheless, my very first game against Anand showed that I wasn't optimally prepared for the tournament. I'd prepared more for the "Berlin", but Vishy had prepared the Najdorf. Zahar and I had looked at some things there too, but after a long break I played my first tournament game a little insipidly, got completely outplayed, and deservedly lost. A loss with White in the very first round left something of an imprint on the whole tournament. I didn't want to lose a lot of games, particularly as I had the "example" of Grischuk and Shirov right before my eyes. Therefore I tried to play more solidly, in line with my form. Maybe that was the reason I let quite a lot of chances slip, for example in the games against Carlsen, Nakamura and Shirov. There wasn’t much fight in some of my games. And as a result - again that same modest 50%. It seems as though from April on I'll have a heavy schedule - I'm planning to play each month. I need to continue preparing, working on myself, and building up my strength and energy so I'll able to seize all my chances! I'm in favour of the idea of introducing the rule forbidding players from agreeing to draws into all major tournaments, as it makes for a more appealing struggle. But at the same time it seems to me (this is another conclusion from Wijk) that it's physically tough for sportsmen to play for seven hours each game, particularly if it's a very long tournament. It ends up becoming more of a test of stamina. Of course, not everyone likes FIDE's time control of 1.5 hours a game, and they're right, in their way. But if a game lasted not seven, but, let's say, five hours, then I don't think the quality of the games would suffer that much. Maybe it would even be the opposite: fatigue builds up after long games, and people end up committing more mistakes. vasa: What's the best novelty that you've used and refuted? I don't think I could pick out any particular game. If you dig around now in a multi-million game database then, as a rule, you can always find that one move or another has already been played - if only in amateur games. The Yugoslavian Chess Informant, as far as I remember, called a move a novelty if it hadn't been printed in previous issues. Nowadays it's much more important to surprise your opponent at the board. And a novelty, on which you've spent a heap of time, becomes available to everyone after you've played a single game with it. carnage: Which do you think is more reliable - e4 or d4? Which systems do you prefer? I've managed to play almost all of the openings in my lifetime. Lately, I've more often been playing closed openings with White. If you're well prepared theoretically - then everything's reliable! - Which first move for White is objectively, i.e. analytically, the best? 1.e4 or 1.d4? - Is the opening position won for White? For now, as far as I know, it hasn't been possible to prove a win. Again, I'm still waiting for the computer's final verdict Perhaps when I get bored of playing chess I'll take up analytical work. It would be necessary to think up something more cunning that the Nalimov tablebases. Otherwise one lifetime might not be sufficient to answer that burning question! Пофигист: Could you give a quick prediction of opening trends for the next 3-5 years: will e4 yield to closed openings, or vice versa? Everything in life goes in cycles. I think 1.e4 will be more popular again, as 1. d4 is being played too often at the moment. In less popular systems it's easier to be first and to find new ideas. Zeppa: Hello, Ruslan! You're one of the main experts on the Berlin Defence, and it would be a sin not to take this opportunity to pose a question to an expert on my favourite opening. On the 9th move Black has a wide choice between all kinds of continuations. As I understand it the most elastic move is 9...Ke8! The king should nevertheless abandon the open file, and for now Black doesn't reveal all of his intentions. The flexibility of that prophylactic move lies in the fact that Black, depending on the situation, can develop his light-squared bishop to e6, d7 or b7; the e7-square isn't occupied and is available both for the knight and the bishop; the option of advancing the h-pawn either one square or two has been retained. However, despite all of those considerations, you've recently been playing 9...h6 exclusively. Can you explain what's behind your preference for that handling of the position? I'm striving to withdraw my king to the queenside as, having lost the option of castling, I'm trying to unite the rooks as quickly as possible. But there have also been games where I've left the king in the centre. - What's your opinion on the Modern Benoni? Does a mathematically proven refutation exist, or should Black have enough resources to maintain a dynamic balance in all the lines of that complex opening? - What's your opinion on the Exchange Variation of the Ruy Lopez? When I was a Class A player, I played the exchange variation too primitively with 5. Nc3 or even 5. d4. Naturally, at a certain point I gave up playing that way. But the main line there is the move 5. 0-0, which Fischer used to play. Karjakin, Motylev and Caruana have played that way lately, so it's something that needs serious study. A very solid opening. I haven't lost a single game in it yet with Black, although it's true that I've played it quite rarely. Still, getting mutual chances with it is quite problematic. You're playing, as a rule, only for two outcomes. Jazzman: What do you think about the current status of the Chelyabinsk Variation? What potential does it have at the highest level? The Chelyabinsk Variation has ceased to be popular recently: neither Leko, nor Shirov, nor Kramnik are playing it now. It's not quite clear, however, which particular system they're worried about. The last time I encountered it, at the Tal Memorial against Shirov, I went for 3. Bb5 on the recommendation of Zahar Efimenko, and won. Экстремист: Is the Scandinavian Defence sound? I think so, yes. Why did you doubt it? Jazzman: The Blitz World Championship was held recently. You took part, and here's my question: which game and which move has stuck in your mind from that tournament? That was the first time I'd played blitz so badly (in the first half I scored +1, while in the second, against the very same opponents, I didn't manage to win a single game), so I'd rather forget about the tournament as quickly as possible. vasa: How would a blitz match end between the current Ruslan Ponomariov and Jose Raul Capablanca in his best form? Please be honest and frank. As far as I remember, back in Capablanca's day they liked to spend a little longer thinking, and they hadn't heard about Fischer clocks at all. So I hope I'd manage to flag Capa! Uralchess: Hello, Ruslan! What's your opinion on correspondence chess? Do you think that the appearance of computers has made it obsolete, or, on the contrary, has it been raised to a higher level? Do you consider it a fully-fledged form of chess? Do you use correspondence databases, and how often? I've never played a correspondence game myself. It seems to me that computers have made correspondence games deeper and more interesting. Should it be considered a fully-fledged form of chess? It's simply a slightly different type of chess, but in general the pieces move in the same way, and after all it's not “Bughouse” or some sort of “Shogi”. I try to use correspondence chess databases. For me using them isn't as convenient as using the standard databases, and I haven't really got the hang of it. It's not so easy to look at the game lists and immediately grasp where the players were amateurs, and where they were strong players. Perhaps you can advise me where I can buy a good database of fresh correspondence games? To be honest, I don't particularly like what ChessBase have to offer. phisey: What's your opinion on Fischer Random Chess? Will it be able to replace normal chess if the dominance of theory becomes absolute? I've only played Fischer Chess once in Mainz. In the opening position of the very first game I had the option of castling long on the very first move! But Fischer Chess isn't being popularised at all: besides Mainz I don't know where else you can play it. So I think it's a little premature to talk about it replacing normal chess. - What happened in the matches between champions and computers in 2002-3? Did they end in draws on purpose for publicity reasons, or was there already a balance of power back then? I wasn't present at those matches, so I've got no way of knowing exactly what went on. It was a little strange that in the last two games against Kramnik in Bahrain Fritz made two short draws and didn't try to develop its match initiative. If, of course, it understood what that means. But, in general, I don't think computers were that strong yet in 2002-3. So why should a human have had to succumb to them? - What do you think the expected score would have been in the Ponomariov-Junior match, if it had taken place? I played against Junior in Bilbao in 2004-5. I lost one game as White, and made two draws as Black. The last of those games ended up being very long – as many as 153 moves, but it could have been even longer. Unfortunately, at some point during the computer's time trouble I played too recklessly, in a human manner, and thereby let my winning chances slip away. I think if I'd played Junior in 2002-3 I'd have had even greater chances! I won't try and assess the current status of Junior, as I've long since stopped using that program. - Could victory in such a match, against the backdrop of the draw by Kramnik in 2002 and Kasparov's loss to Deep Blue in 1997, have raised the FIDE World Championship title above the match title? Valchess: It'd be interesting to hear more about your view on the development of computer chess as a whole. To begin with I'll state a fact: nowadays matches between humans and computers have, unfortunately, ceased to provide any sporting interest. In a long match it's difficult even to compete against a program playing on a standard notebook. It's more interesting, at the moment, to watch computers play each other. It's a blessing that they can play, without getting tired, even for nights on end! Programs are also good analysis assistants, and for some people they've even replaced coaches. I recently read a story on the internet about a match between Rybka and the free program Houdini. The final result came as something of a surprise to me. After all, a commercial program should have some sort of advantage over a free one! Although that same Rybka previously lost a match to the program Zappa which, however, didn't stop Rybka's creators from improving it further. I expect the same this time round! For the average user the appearance of a strong free program is an undoubted plus. Personally, on my desktop computer, I use the free Ubuntu instead of Windows, and Open Office instead of Microsoft Office. It's great that we've now got such an alternative in chess as well. Previously there were a great number of programs: Junior, Nimzo, Hiarcs, Fritz, Shredder. At the same time it wasn't entirely clear to me what the main difference between them was, particularly as all the programs had almost identical packaging, with only the colour of the board distinguishing them. Then Rybka appeared, which you could download from a link you were sent after paying. And then there was a new version, packaged differently as well, as Aquarium. Real progress for the user! Now the free Houdini is available. I've tried it, and it genuinely is a good program. In certain respects it's even more convenient to work with. Rybka, for example, tries to use up almost all the resources it can, and at some point my computer begins to hang. I haven't seen that with Houdini: I can comfortably multi-task. For me, so as not to waste money on buying powerful computer technology which you still have to operate, it would be interesting to buy databases of computer games played by strong programs on powerful computers. The endgame in those games wouldn't be so important, so you could limit them to, let's say, 40 moves. But what will be more commercially warranted, and what will they offer users - that's something we'll have to wait and see. Jazzman: Ruslan, do you like playing computer games? If yes, then which? I consider computer games an evil taking away a heap of time. Although, as far as I know, there's such a thing as cyber sport, and I think it would be interesting to watch professionals play. Once, on the Discovery Channel, I watched a series of programs devoted to historical battles. Later I found out that the imitation battles had been produced with the help of the game engine from the Total War computer game. I wanted to take a look at that program, and I also developed a greater interest in history. In particular, I bought a number of volumes by Theodor Mommsen on the history of Ancient Rome. - Could you tell us whether you have chess-related dreams? Perhaps I dream of something, but in the morning I no longer remember a thing! - If a time machine existed, is there anything you'd like to change in your life? Some mistake you'd like to correct? No, I wouldn't want to. Another reason being that after those changes perhaps the "butterfly effect" would come into operation? Volkov Youry: Could you tell us if you're married? And, if possible, a little about your private life? No, I'm not married, and I haven't been married even once yet. Though recently Zahar Efimenko and I have been spending so much time together that I'm wondering whether to propose to him. Глафира: If it's not a secret - have you determined your personal plans for the future? I'd like to have more definition in my life: at the moment I'm living sometimes in Moscow, then Kiev, then Bilbao, then somewhere else as well. But, unfortunately, not everything in life depends on ourselves alone. Time's passing, and everything's constantly changing. Vano 701: Ruslan, how did you learn English? And other languages? I can't say that I've learnt English. For me, my level of English is quite primitive. Peter Svidler – now there's someone who's really learnt English! But I'm trying to improve: watching films, reading, practising. It seems to me that in order to learn a language it's also important to spend some time living somewhere where the language is spoken by native speakers. But so far I haven't been to the USA and I was only in England once in 1999, and even then for a very short time. Jazzman: Do you like jazz? I can't say I'm a jazz fan and have a good knowledge of its history, but I like to listen to good music of any genre. I like Louis Armstrong. - How do you feel about music as a whole? What does it mean for you? Do you play any instruments? What, in your view, do music and chess have in common? My younger sister plays music professionally: she's now studying in the conservatory, and specialising in the violin. But she doesn't know how to play chess, except perhaps how to set up the pieces. For me it's the exact opposite But I do, of course, love music – without it life would be a little dull. It's hard for me to say what music and chess have in common. But I saw how they tried to combine music and chess in the musical "Chess". They ended up with something a little peculiar, it's true, and more for the connoisseur. - Do you go to concerts? If yes, then which? I still remember concerts by Rammstein, Seal and Aria. For example, before the Dortmund 2010 tournament I went to a Rammstein concert – and received a great boost of positive energy! That wasn't actually their own concert, as they were playing in a rock festival. Nevertheless, they did their best for the public - playing all their hits and something from their new album. At a certain point it started to rain, and the concert was out in the open But no-one in the audience moved an inch. And when the music was combined with their traditional pyrotechnic display things soon heated up! - What do you think about poetry? Who's your favourite poet? I prefer to listen to poetry set to music. Grebenshchikov, Vysotsky and Shakhrin. It strikes me that their poetry would sound a little bare without music. - How do you assess the cultural level of the youth of today? - Which book (of any kind) has had the greatest impression on you? Which musical work? It's hard to say: impressions flare up in your head and then they pass. Among books, probably the Bible. There was an interesting film, "The Book of Eli", precisely about what a powerful force it represents. Among musical works - "La Marseillaise". The curious thing is that it was written by an amateur musician. Therefore you can't compare it, of course, to the works of, for example, Mozart or Beethoven. But at the same time it conveys a powerful positive energy, and the story connected to it is also extremely interesting. Глафира: Which books and films do you prefer? I don't have any particular preferences in terms of genre - the main thing is that the books and films are good. In literature I probably prefer short stories: the ideas in them are expressed more clearly and succinctly. That's particularly relevant for me during chess events, as long works can distract you so much that you start reading them into the early hours Among authors I could mention: O. Henry, Chekhov, Gashek, Zoshchenko and Bradbury. Valchess: Do you have any favourite films? It’s not very often that I rewatch any particular film a few times. Perhaps the Woody Allen film, "Small Time Crooks", is the exception to that rule In general Woody Allen is probably one of my favourite directors. He's a bit like O. Henry, just in cinema! phisey: Ruslan, do you go hiking in the mountains? I'm grateful to my friend, Evgeny Gurko, who got me into hiking! Unfortunately I don't manage to do it as often as I'd like. So far I've only been to the Ukrainian Carpathians and the Crimea. It would be interesting to try hitchhiking. As it is I'm afraid that afterwards as I get older it might already be too late! - Which sports do you like? Do you take part in any sports yourself? Which? Are you a fan (particularly a football fan)? I prefer competitive sports, particularly when they reach the play-off stages. There's much greater passion and tenacity! I don't engage in sports myself, as chess is quite enough for me. I prefer to work on my fitness. - You've travelled a lot. Where did you like the most? Chemer: Ruslan - I'd like to ask what your attitude to alcohol is, and if someone has a problem with it is it realistic to expect them to kick the habit? Play chess, and your hand will begin reaching for a pawn more often than for a glass! megamog: Hello, Ruslan! I'm interested in your attitude to religion, faith and Christianity. And not only yours, but that of other strong chess players with their powerful intellects. Is it the opium of the people, or is that nevertheless not the case? You've posed too serious a question to give a simple answer as part of this Conference. In general, I'm in favour of religious freedom, whether that means Christianity, Islam or Buddhism, and of people being able to observe their own rituals and traditions. As far as I know among chess players V. V. Smyslov was a highly religious man. And even many cosmonauts have believed in God. Мастер Икс: Dear Ruslan! Imagine that certain forces have offered you a deal. You can exchange your chess talent and all your achievements and awards for the talent of a Noble Prize winner. Would you agree? If yes, then in what field would you like to become a prize winner? Science (which? ), literature or politics? No, I don't think so. Such a deal smacks a little of deception. I think that in life you have to try and value and cherish what you've achieved and what you're capable of doing. phisey: Do you regret the collapse of the Soviet Union? Was it worth breaking that broom up into the separate twigs that are now so weak and fragile? I think too little time has passed since the collapse of the Soviet Union in order to assess the event historically. Personally, I don't regret it. Perhaps this will sound a little egotistical, but for me, as a sportsman, it opened up more opportunities to travel abroad, and it also made me less dependent on the sport committee. Валентин: Hello, Ruslan Olegovich! Congratulations on your win in the super-tournament in Dortmund, and on the Ukrainian team's victory at the Olympiad!!! - Why do Ukrainians play so well in such a complex and intellectual game as chess, but live so poorly? It seems to me that those Ukrainians who play good chess don't live quite so poorly. Everything's in our own hands, and Ukraine can be up there at the top not only in chess! - Do you watch the box? Which programs? Because of the abundance of adverts and censorship I don't watch the "box". The internet is quite sufficient for me to get information. Although, if there was digital television in Ukraine and the opportunity to choose, then it's possible I'd subscribe to a few channels. - When will chess end up on Ukrainian TV? In order for chess to get on TV you first need to think up an interesting format for a programme that could be broadcast regularly, or else you need to start running major chess events in Ukraine, so that there's something to show. It also seems to me that the way television operates nowadays people are afraid to experiment: it's simpler to buy a ready-made idea that's already been tried and tested in another country. I wouldn't rule out the possibility, for example, that somewhere in Germany an interesting chess programme will emerge, which will then be bought first in Holland, then England, then Russia and then it might finally make its way to Ukraine. They often say that chess is tough for an average person to understand at first, and the games can be very long. At the moment poker has started to be broadcast in many countries. For me, as an amateur, it's hard at times to fathom the long pauses and thought processes of the players with only two cards. But nevertheless, you keep watching - what will the next card be, and who'll win! Valchess: Do you take an interest in politics? Could you outline your political views? I periodically read the internet edition of www.pravda.com.ua, and when I have the opportunity I watch Euronews, but I can't say that I'm particularly interested in politics. After all, it’s neither my job nor my hobby. - Which party did you vote for (if you voted at all) in the elections in the 2000s? It seems that I first went to vote in 2002, when I turned 18. I think I voted for "Our Ukraine", but not because they struck me as particularly good. It was simply that the rival party, "For a United Ukraine", printed a calendar with my image and a logo from one of my games without my permission. I considered that a violation of my rights and as a minor revenge I decided to vote for the opposing party. - Which party are you planning on voting for (if you're planning on voting at all) next time? In Kiev, unfortunately, it's a bit of a mess: some elections were cancelled, and they appointed a man to run the city who was close to the president's administration. It turned out I was deprived of my right to vote! But otherwise, I'd probably have voted for Klichko. - How would you define your political convictions? --- communist, monarchist, liberal, nationalist, or something else? I don't like dictators. But not enough time has passed, so let history judge them. vasa: Were the questions you were asked interesting for you? Yes, thank you to all the readers who’ve shown an interest, and also to the editors of Crestbook for their professionalism! This conference was prepared by Valery Adzhiev (Valchess), who edited the text and translated the English questions into Russian, Stanislav Fisejsky (phisey) and Colin McGourty (mishanp), who translated the Russian text into English. Vasily Lebedev (vasa) was responsible for the chess fragments.